Don’t know why, but I am so excited to see this. I don’t know how I haven’t yet! 0:03 This is reminding me so much of Clue. Which came first, this movie or the board game? 0:05 This doesn’t even look like a house, it looks like a giant prison. It’s still creepy. 0:16 Older movies like this are far more interesting to learn how they were made than most filmed today. 0:20 When that lady thing walked through the doorway and then out: SO CREEPY. 0:22 Apparently it was a ghost, but whatever. Still creepy. 0:25 This old witch is gonna give me a heart attack. 0:28 B&W film interests me so much,& not cheap B&W filters used today,but actually shot in B&W.The shadows are awesome. 0:45 This dude has had like 4 of his wives die on him.. Give up already. 1:00 Why do I feel like everyone wants to get it on with this dead girl. 1:02 Oh a twist a twist! 1:06 This skeleton guy is so cool! 1:07 But really though, the skeleton was moving really slow and the room was pretty big. She coulda ran away. 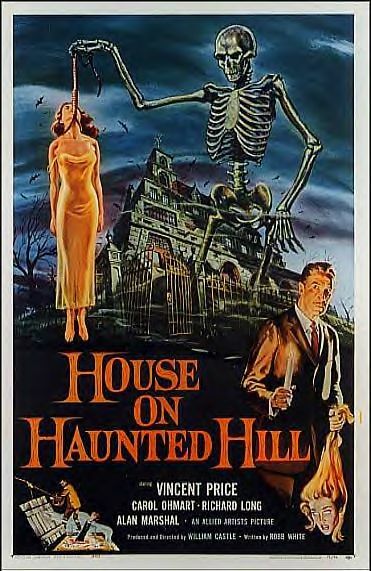 Totally glad that #HouseOnHauntedHill was as good as I thought it was gonna be. Probably one of the creepiest movies I’ve seen in a while. More old black and white horror movies to come!